The 32.61 metre motor yacht Las Morochas, listed for sale by Merle Wood & Associates and Atlantic Yacht & Ship, has been sold. 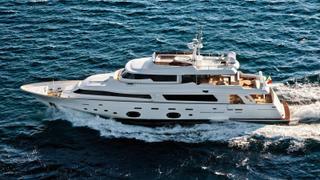 Launched in 2012 by the Ferretti Group as one of the first models in the yard’s Custom Line Navetta Crescendo 33 series, she was built from a GRP hull and superstructure to a design by Zuccon International Project and the Ferretti Engineering Department. Her accommodation is for ten guests split between five staterooms, including a main deck owner’s suite that has been fitted with a 55-inch Samsung LCD television. Meanwhile, the crew quarters are located in the bow and allow for a staff of up to seven people. Automatic sliding glass doors lead from the cockpit into the saloon, with its Minotti sofas and elegant and contemporary interior, finished in oak, teak and leather. Further forward is a formal dining area with space for eight guests to enjoy a meal together. An adjacent galley allows for premium service, with Miele appliances and Quartz counter tops. The upper deck is another key feature, boasting a circular spa pool, waterproof speakers and plenty of sunbathing space. Power comes from a pair of 1,550hp MAN diesel engines that push her to a top speed of 15 knots, topping out at 18 knots, while a total fuel capacity in excess of 17,000 litres allows for extended coastal cruises. Las Morochas was asking $6,650,000.